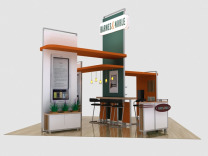 Great Island Displays: is a new product line for Classic Exhibits which builds upon their success with in line exhibits to take island trade show displays to a whole new exciting level of looks and performance. 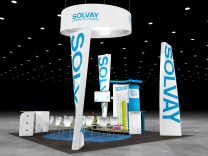 Adapting to changing market conditions is what every great supplier must do, and Classic Exhibits, to the delight of their trade show display distributor network, has shown their ability to accomplish just that. 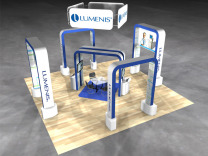 What steps did they take to succeed during a time where little new innovation was being introduced in the trade show industry? Classic noticed that there were several shapes of aluminum extrusions that that they already purchased that gave them an extraordinary large amount of linear footage per dollar when compared to others. 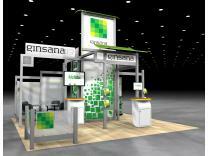 Their ingenuity and creativity have produced several entire lines of custom modular hybrid displays and provided the market something new to look at. 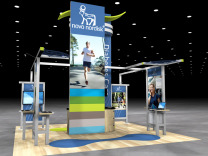 You may have heard of some of the excellent new lines that Classic Exhibits developed recently, starting with the Perfect 10 and Magellan Miracle tension fabric display systems, followed up with the Sacagawea custom modular hybrid display system. For the distribution network for Classic Exhibits products, the future looks bright because of the creativity and ingenuity on Classic’s part, and some great marketing through a program they created called exhibit design search, which is an online search program for trade show booths which we utilize extensively on the ShopForExhibits.com web site.